Join us for an evening of data, food, drinks, and networking on April 4, from 5:30 – 9PM! 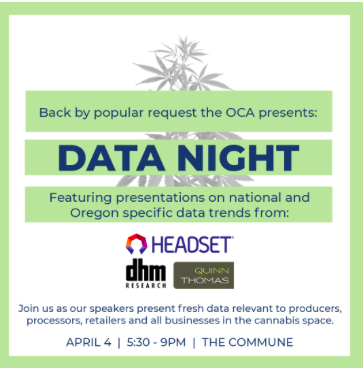 We will be joined by Headset, DHM Research, and Quinn Thomas for a presentation on data trends in the cannabis space based on new reports. The topics covered include consumer demographics and behavior, product preferences, and perceptions of the overall retail experience. This is one of our favorite events from last year and is back by popular demand. If you are an OCA member check your email for your discount code.